My hair products have changed drastically since the last time I posted about the products I use. Right now I have completely stopped using all heat tools including straighteners and blow dryers. My hair is naturally curly so I have to treat it with extra care. I have stopped using sulfate products. I did not realize that sulfate shampoos and conditioners were harmful to your hair, and will strip your hair of all its natural oils. Raw Shea Butter Moisture Retention Shampoo: This shampoo includes sea kelp and argan oil. This helps dry, damaged hair to heal, it also strengthens and promotes hair growth. It is sulfate free and color safe. Raw Shea Butter Moisture Restorative Conditioner: Just like the shampoo, this conditioner includes sea kelp and argan oil. Helps with dry, damaged hair to heal. Promotes hair growth and strengthens your hair. It's also sulfate and color safe. This leave in or rinse out conditioner detangles, moisturizes, repairs and restores damaged hair. 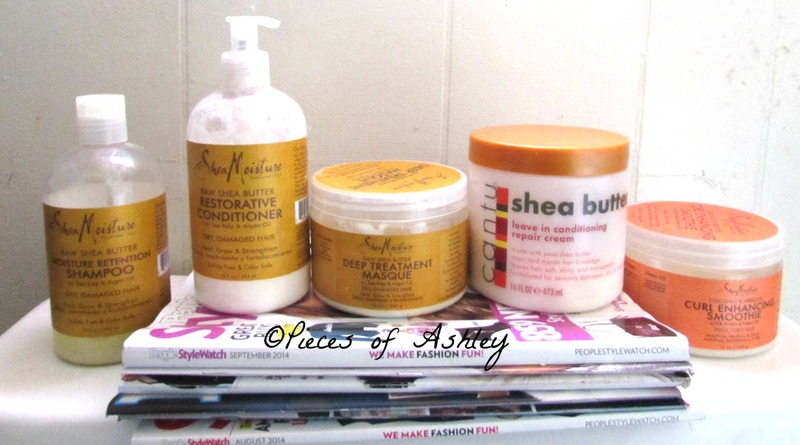 Raw Shea Butter Deep Treatment Masque: This masque deeply moisturizes and repairs over processed hair. It is also good for transitioning from chemically treated hair to natural. In these products the sea kelp is mineral rich and it seals and smooth's hair cuticles. As for the argan oil, it restores shine and rebuilds hair elasticity. The Shea butter deeply moisturizes your hair, and in the process also conditions the hair and scalp. Coconut and Hibiscus Curl Enhancing Smoothie: This curl enhancer includes silk protein and neem oil. This is for thick, curly hair. It helps with frizz and brings your hair moisture and shine. This is also sulfate free and color safe. I love this because it defines my curls and reduces frizz while bringing moisture to my hair. This does not weigh the curls down. In this product the coconut oil hydrates and protects the hair while reducing breakage. The silk protein smoothes the hair for a soft feel. As for the neem oil it controls frizz, and at the same time provides the hair plenty of shine. I recommend all of these products they are worth the buy. You can buy these products at CVS, Walgreens, Walmart, and Target.